Personnel – Marty Ehrlich: alto saxophone, clarinet, bass clarinet, wooden flutes; John Hébert: double bass; Nasheet Waits: drums. 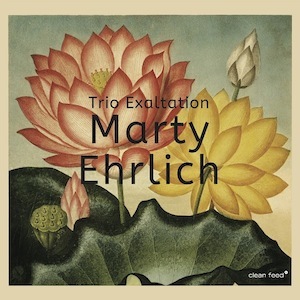 Multi-reedist Marty Ehrlich, a devotee of compositional adventurism and vertiginous improvisations, is always surrounded by musicians who think alike and are capable of intuitive interplay with an elevated rhythmic perception. His new high-profile Trio Exaltation, featuring John Hébert on bass and Nasheet Waits on drums, proves what I just said. The trio opens the album strongly with “Dusk”, an original by the late pianist Andrew Hill with whom all of them worked in the past. It starts off as a spellbinding saxophone incantation backed by lively, gorgeously detailed percussion. The bassist only arrives two minutes after, locking down an encouraging groove with clear intent and purpose. He stretches out later in a stroll that subsists in its own pace, regardless the drummer's polyrhythmic fills. The rhythm section becomes more strenuous on the following piece, “Yes Yes”, whose textural audacity results from a fine combination of bass adventurism and an impermeable yet tasteful net of cymbal crashes and tom-tom fantasies. Unconfined and utterly expressive, the clarinetist spreads a breathtaking fervency while exulting in a prayer. Multiphonics and unexpected piercing notes are constituents of his hip melodic oddities. In opposition to the dancing spirituality of “Spirit of Jah No.2”, an exhilarating piece for wooden flutes and African-tinged percussion, the haunting sounds of bass clarinet are exerted in compositions with a more reflective and contemplative nature, cases of “Dance No. 5”, a far-from-ethereal John Surman-esque illumination played in five, and “The Arc of the Oar”, an imperturbable duet with Hébert, where the melody of Coltrane’s “Giant Steps” is revived. Sometimes Ehrlich’s approach is clean and transparently lyric, other times it may come intoxicated with searing lines professed with variegated timbres. This last aspect is particularly noticeable on pieces like “Senhor PC” (not for Paul Chambers but for Clean Feed’s Pedro Costa), a free ramble with questioning motifs and ruminative arco bass conspiring with Waits' mallet drumming, and “Stone”, a burner that keeps instilling brief swinging rides amidst avant-garde passages delineated with free bop melodic moves and sudden boisterous drum chops. With the closing piece, “Reading The River”, a deliberate swinging groove is definitely put into effect. It is not rare to find shades of Ornette Coleman throughout these pieces and “June 11th 2015” was precisely dedicated to him. The Exaltation Trio creates mesmerizing sonic atmospheres based on the supple interplay and expansive personal statements of its members. If their openness facilitates communication, then their ample sense of freedom concedes fearless exploration.